International Journal of Research in Health Sciences,2014,2,1,162-165. 1DA., DNB, Specialist, Department of Anaesthesia, ESIC Medical College and PGIMSR, K. K. Nagar, Chennai -78, Tamil Nadu, INDIA. 2Dr. P. Sureshu, MD, Consultant Anaesthetist, Appasamy Hospital, Arumbakkam, Chennai-106, Tamil Nadu, INDIA. 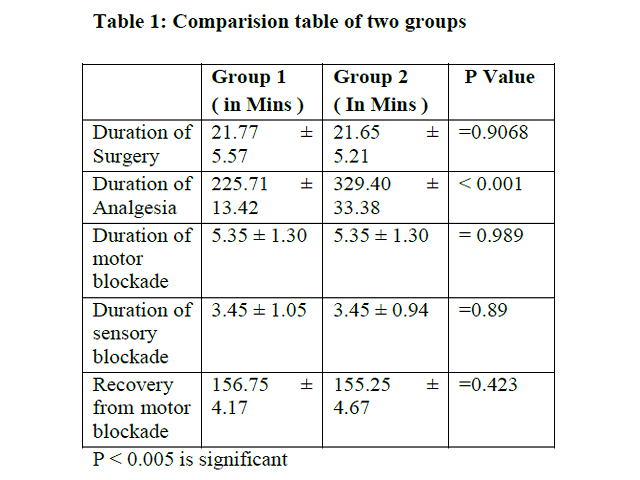 Subarachnoid block with bupivacaine is routinely administered for perianal surgeries. The ensuing nerve blockage is sufficient to facilitate the surgeon’s work and also provides effective pain relief during the initial postoperative period. A number of adjuvants have been added to intrathecal bupivacaine to maximize postoperative analgesia. Intrathecal supplements for postoperative pain relief is becoming more popular as they eliminate the need for intravenous and intramuscular analgesics and their associated complications. Perianal surgeries are extremely painful and hence chosen for this study. Postoperative pain relief can improve functionality, reduce physiological and emotional morbidity and improve quality of life. One of the methods of providing postoperative analgesia is by prolonging the duration of intrathecally administered bupivacaine by additives such as opioids, clonidine, ketamine, midazolam etc. Intrathecal opioids were used with success but with high incidence of side effects. Midazolam was taken as an alternative for opioids in this study. The duration of analgesia was significantly prolonged in the midazolam group (p < 0.005).